“What you up to today?” Asked Adrian. “Just took delivery of a folding electric scooter want to hold the camera while I test it?” I replied. I attached my iPhone to a handle, clipped on the Sennheiser Memory Mic and Adrian arrived. We had fun grabbing a few shots that I edited on the phone in LumaFusion. Here it is on Youtube.. If you’ve read my blog for a while you’ll know how much I like my scooter(s). From my prototype carbon Microscooter to my sensually named ‘Flex Deluxe’. Two years ago I got to borrow the eMicro. It especially came in handy after I damaged my foot when out running. I did a fair few miles on the eMicro which was not continuously powered but power assisted. A totally different thing to the Microscooters Condor X3. This time Microscooter has gone for a throttle grip. This in turn has resulted in the addition of a powerful front brake to accompany the back brake. Technically the Condor has three brakes. If you turn the throttle forward and not back it will engage regenerative breaking. This is also engaged when stepping onto the back break. I’m not sure if these micro charging moments are taken into consideration in the final range but i’m sure to have fun finding out. I was happy with the speed on my first trip out but once I figured how to switch settings (tap the back break four times and then scroll through the four speed settings with another tap) I realised I must have been on eco mode. Now i’m enthralled with the speed and suddenly feel the need for a helmet. I was going too fast to tell him the Condor cost £1099 and he may want to ask Santa for the Micro Sparrow. It’s less than half the price and designed specifically for kids in mind. The Condor, although restricted to 15mph (the legal limit for ebikes) is too fast for kids. IMHO. Here are a few considerations to think about. The ride is hard. It’s certainly an improvement on the first eMicro but you will need to bend your legs when you hit uneven ground at speed. Smooth roads are a dream. Stick to them. Around twice the price of some other scooters. The closest competitors in my opinion are Segway, Gotrax and Xiaomi. Different beasts with different folds, ranges and features but sometimes people only look at cost and not what you get for it. No visible speed, distance and range stats. I’m glad that Microscooters do not do an accompanying app but out of all the scooter brands, if they did I trust it would stay compatible longer than any flash-in the-pan competition. That said. This is a serious commuter vehicle and I’d like to see more than what the four LED’s offer. No internal front light. The internal rear lights are really good and although the Condor comes with a detachable front light it’s easy to forget. I imagine this was done because no internal front light will suit everyones needs. I have already attached a more powerful LED light that i’m more than happy with. Well balanced. With all the main weight below the feet, the center of gravity makes for a well controlled ride. Great brakes. Almost too good. I pulled an endo with the front break. I quickly learned to keep my weight back when stopping fast. That said I just use the regenerative (reverse throttle) break 90% of the time. 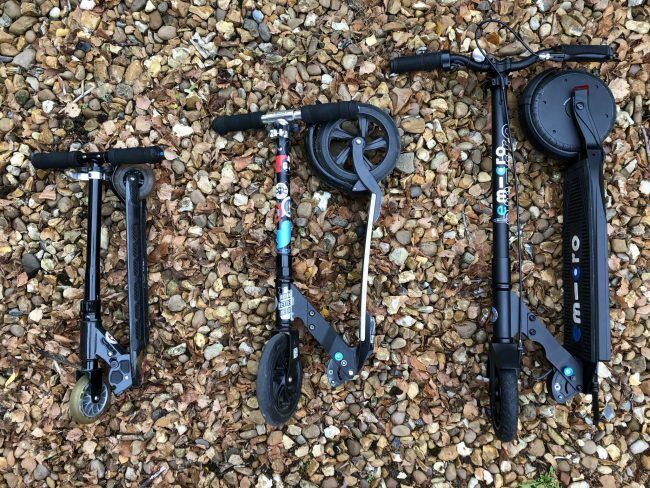 The increased speed of these types of scooters needs decent spotting power and the Condor has it. It has the shortest stopping distance of any scooter I have been on. Powered or manual. Lighter than much of the competition. Considering the range and how well built this scooter is, it’s not a chore to carry and lift. It’s around the same weight as a lightweight Brompton. Long Warranty. With a two year warranty on the hardware and one year on the battery, they are obviously not that worried about things going wrong. Low maintenance. With the sealed drum break on the front you will find little maintenance needed outside of the occasional tightening of a bolt. Great wheels. Microscooter has really thought about the tyre compound and wheel size. It’s not recommended to ride any small rubber wheeled vehicle in the wet but I have had to over the last two days and their new tyre compound has been a revelation. This kind of vehicle used to have terms like ‘last mile transportation’ attached to it. It was sold in the hope that more people would take public transport and finish their journey on two wheels. With these new speeds and ranges though it might be you can ditch the car, bus or train and scoot all the way. To give you an idea of size here is my carbon fibre Micro, the Flex Deluxe and the Condor X3 side by side. Tomorrow I plan to do some decent miles on the Condor for a proper range test, but already I can see it is a serious electric bike alternative as well as a whole load of fun. 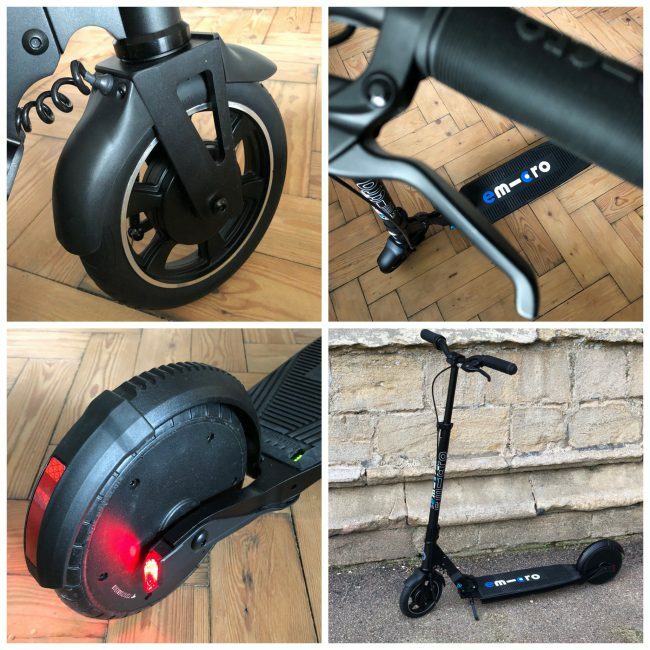 It has become my favourite scooter by a long shot and I’d argue that this is the best adult electric scooter on the market full-stop. I’m @Documentally on Twitter & mostly share to my newsletter – click here to subscribe to it for free. Check out my upcoming workshops. web site to take newest updates, thus where can i do it please help out.